Brushing is an integral part of good oral hygiene. However, people often forget that their toothbrush also needs to be taken care of. The cosmetic dentistry practitioners at Buhite & Buhite, DDS understand the importance of keeping your toothbrush clean. According to these dental experts, the bacteria that thrive in a dirty toothbrush can contribute to oral problems. Never Share Your Toothbrush: This unhealthy practice can endanger the health of both users. You can catch or spread infectious diseases by sharing toothbrushes, as saliva and bacteria can be transferred to your mouth. Rinse: After brushing, rinse your toothbrush with warm water to wash off the lather and food bits trapped in between bristles. Place your toothbrush in a clean toothbrush rack in an upright position and let it dry. Don't keep your toothbrush in a closed container since a damp environment makes an ideal breeding ground for bacteria and other microorganisms. Keep It Away From The Toilet: Unsanitary water from your toilet can spray several feet into the air each time you flush. The water can easily land on your toothbrush and other oral products if they are kept too close to the toilet bowl. To prevent this from happening, avoid placing your toothbrush on a surface that is above or next to your toilet. Replace Your Toothbrush: Cosmetic dentistry experts recommend replacing your brush at least every three to four months or when the bristles become worn. 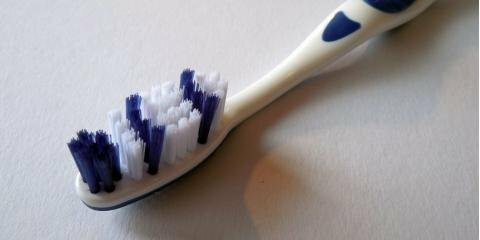 Your toothbrush is not as effective at cleaning your teeth when the bristles are frayed. If you need professional advice on proper oral hygiene or are in need of cosmetic dentistry services, set up an appointment with the Buhite & Buhite, DDS today. Call them at (585) 342-1323, or visit them online for more information.